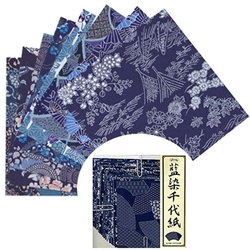 Aizome Chiyogami Washi Origami Paper 6"
Yuzen Origami Paper → Aizome Chiyogami Washi Origami Paper 6"
Aizome Chiyogami Washi Paper is a specialty origami paper that blends intricate Japanese designs, rich blue color and soft textures. Each pack contains 8 sheets of 6" origami paper and individual sheets have a unique design so no two projects will be alike. This Aizome Chiyogami Washi Paper is silkscreened with rich indigo color and a fabric-like texture. Aizome Oragami Paper is a specialty paper that blends intricate japanese designs, rich blue color and soft textures. Each pack contains 8 sheets of 5 7/8" oragami paper. Each sheet will have a unique design so no two projects will be alike. Sophisticated origami artists might also be interested in Robin Joy Riggsbee's Origami Paper #2 or the Yuzen Chiyogami Origami Paper Pack.